The Stamp-a-Memory challenge this time around is to use black and white plus one other colour of your choice. I chose Pink (Pink Pirouette to be precise). Once again I have used one of my sister-in-law Shelley Wendt's gorgeous photos, this time of my youngest niece Miss Briannah. 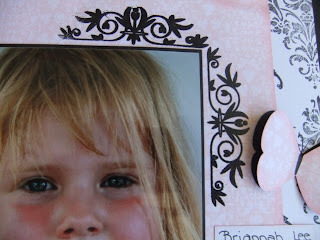 I stamped and heat embossed a corner detail using the Frames with a Flourish Stamp set. I used 3 different sizes of circle punches to make my flowers. 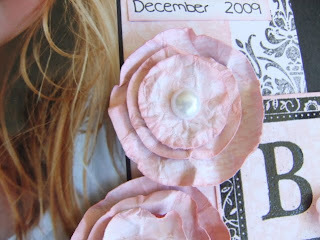 The punched circles were crumpled and sponged with Pink Pirouette ink before being adhered together with dimensionals. I used white half-pearls from the Pretties Kit for the centre of my flowers. 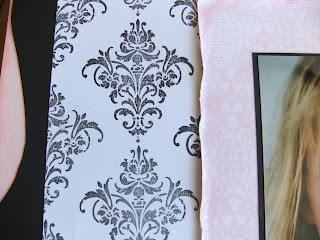 I made my black and white background paper using the Damask stamp from the Friends 24-7 stamp set. I used my trusty stamp-a-ma-jig so that I could stamp the images fairly evenly. Leaving the stamp-a-ma-jig in place also meant if my image didn't stamp clearly I could re-stamp before moving it (and yes that happened several times). I had a lot of fun with this challenge and I adore this photo of Briannah - pretty and wild at the same time. Pink, Black and white always looks very chic together. I also love your use of embellishment on your page. Especially your flowers. This is stunning! I love your handmade DSP, the embellishments, the ribbon feature... all of it! That's a fabulous layout Lisa - just love it! Pink looks awesoem with the balck and white! All I can say is WOW. This is going to be a very hard challenge to judge! Wow! Absolutely stunning layout. It's so girly and pretty. Love it! What a stunning page! 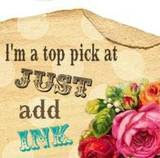 I love that flourish stamp and the corner flourish too. A cute little girl too. She looks like she is a real character! I love the way you have done your flowers. Just gorgeous! Looks terrific. Love those colours together. Congratulations Lisa! I was hoping you'd win - your page is so gorgeous! 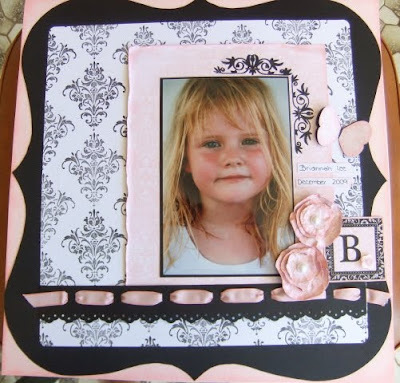 Beautiful page Lisa - love that colour combo and that is such a lovely photo. Congratulations on your win, Lisa; this is a truly beautiful layout. Congratulations! I loved how you created your own dsp.. Kudos for all the time that would have taken! Turned out gorgeous - well done!